In recent years movie goers have been bestowed several spectacular award winning films set within Middle Earth. Gamers on the other hand have had a prolonged wait for the essential game adaptation of J.R.R. Tolkien’s Lord of the Rings saga. In August of 2013 an artist working for Monolith Productions out of Kirkland, Washington leaked that the company was developing a new undisclosed AAA game, and two months later, Monolith officially announced that they were in development of a new Lord of the Rings game titled Middle-earth: Shadow of Mordor. One year later and Shadow of Mordor has arrived. Most will instantaneously notice certain similarities to other franchises including Ubi Soft’s Assassin’s Creed, and Rock Steady’s Batman Arkham games, but Monolith has succeeded in making their experience unique and distinctive from the rest. 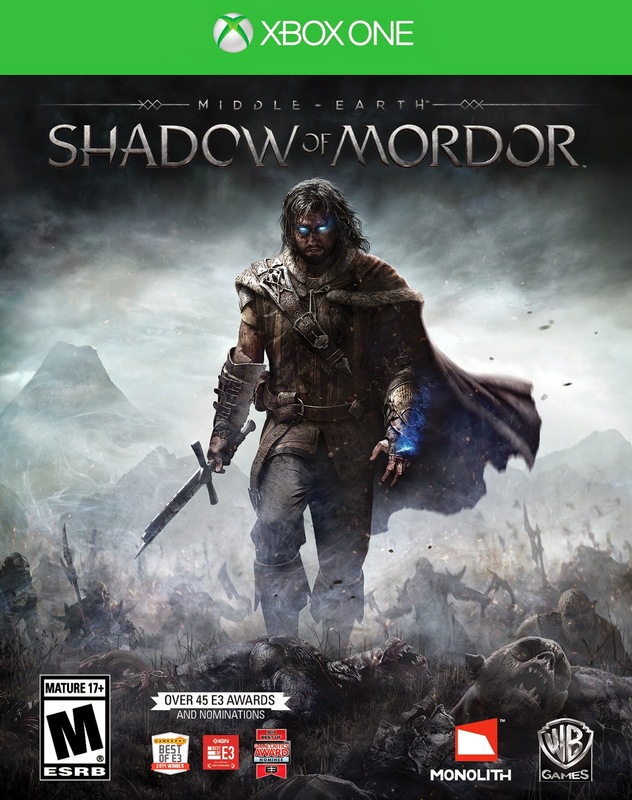 Shadow of Mordor takes place between The Hobbit and The Lord of the Rings and follows the story of a ranger Captain by the name of Talion. Stationed at the Black Gate of Mordor, Talion and his garrison are attacked by Sauron’s army led by the Hammer of Sauron, The Tower of Sauron, and the Black Hand of Sauron. Talion, his wife, and son are captured only to be brutally killed in an attempt by Sauron’s army to summon the wraith Elf Lord Celebrimbor. The Elf Lord, suffering from amnesia, merges with Talion which prevents Talion from suffering the same fate as his family. Talion gains wraith abilities, and along with Celebrimbor set forward into Mordor to avenge the death of Talion’s family and to discover Celebrimbor past. 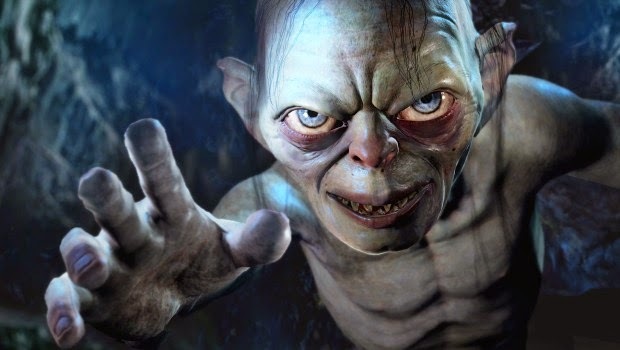 Gollum, who is arguably one of the most popular characters of the J.R.R. Tolkien’s Lord of the Ring universe, makes frequent appearances throughout the game and aides in story progression. The game’s cut scenes and in game dialog allow for a story that is both interesting and easy to follow. The story was engaging so much so that I found myself secretly cheering them on in my head after each victory against Sauron’s army. Shadow of Mordor is a third person open world game which is divided into the main story, power struggle, and side missions. Quite often the main story missions require several tasks to be completed first, before advancing to the next mission. 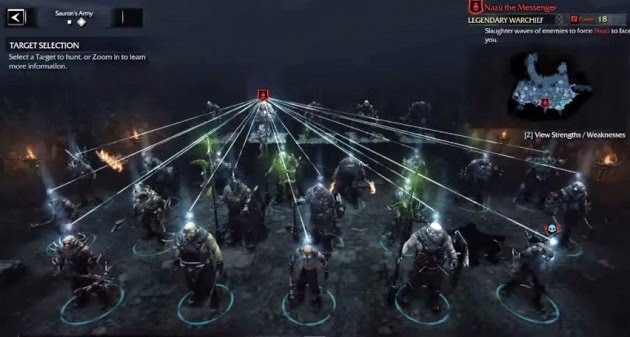 This gives the player a choice to play power struggle, and side missions to build up Talion, in preparation to take on Sauron’s army, which can be a requirement to advance in the game. There are two types of Power struggle missions. The first, Captains, is one in which Captains, who are second in command are constantly on the lookout for additional grunt Uruks who wish to compete in effort to become a Captain. The second type of Power struggle mission is Warchiefs, similar to Captains, they must guard against Captains and other Warchiefs looking to be promoted. 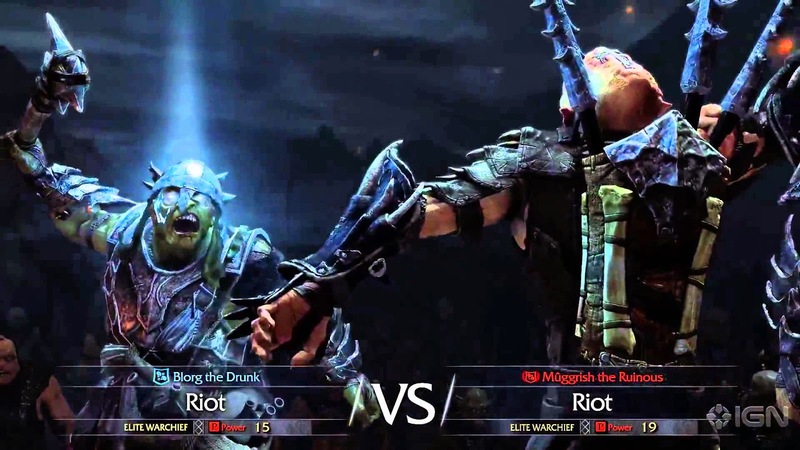 Monolith used what the developer calls a Nemesis system for the game. With the Nemesis system, Captains and Warchiefs are tracked, and when Talion defeats these Captains and Warchiefs; it weakens Sauron’s army and special runes are acquired from their defeat. These runes can then be installed on Talion’s sword, dagger, or bow, and in turn further enhance the weapon in which it was installed on. For example a rune called the Breath of Light, which is installed on the dagger allows the player to recover a certain percentage of health when using a stealth kill with the dagger. One key element when engaging in battle with the Warchiefs, is that the Captains always come their aide. If you approach the Warchief first, without engaging the Captains, then you will find yourself in bit of a predicament each time. What happens is that the Captains initial animation/interaction with you will not have occurred. When the Captains catch up with you, the animation sequence will begin, and their taunts are played with the end result being that you are no longer focused on the attacks, and the camera is most times facing the opposite direction; allowing cheap attacks to be landed once fighting resumes. Similarly when running away from attacking foes, if you run into an object and try to climb it, you will be stuck for several seconds and have to get Talion free from the invisible trap he appears to be in. Just as the player is rewarded for defeating these Uruk leaders, losing to them also has consequences. 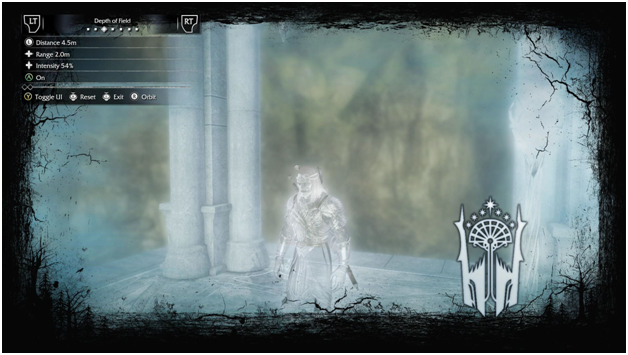 If Talion dies while battling any of the Uruk leaders, the mission is abandoned, the Uruk leader gains power, and the player is returned to one of Celebrimbor’s towers. 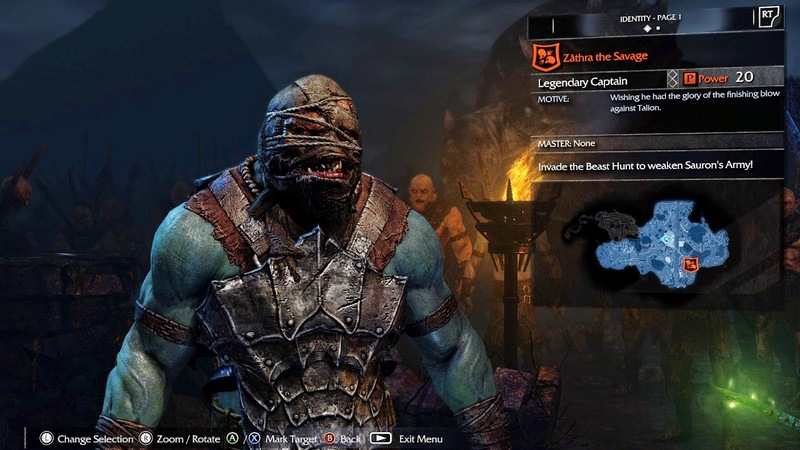 The promoted Uruk leader then is significantly stronger, and more difficult to destroy the next time that Talion encounters him. Talion has the ability to discover each Uruk leader’s strengths and weaknesses through various maneuvers such as talking with rescued slaves, discovering hidden items, or by draining the knowledge from certain Uruks. Utilizing this intel to defeat the Uruk will reward the player with higher XP and more powerful runes upon their defeat. A key feature of the Nemesis system is that anyone who Talion battles, if not defeated will remember the previous battle and seek revenge. Further into the game Uruks can be controlled by Talion, and pitted against other Uruks to weaken Sauron’s army. A Photo Mode is included in the game, which allows the player to capture screen shots, add filters, and overlays. The player is then able to share these screen shots on social media all from within the game. Monolith has released downloadable content known as DLC so that after you have beaten the game there is even more of a reason to return to return and explore Mordor. As of the date of this review the following DLC has been released. Lord of the Hunt, which follows an additional story line around one of the characters from the game, Torvin, while introducing new monsters, missions, challenges, runes, and player skins. 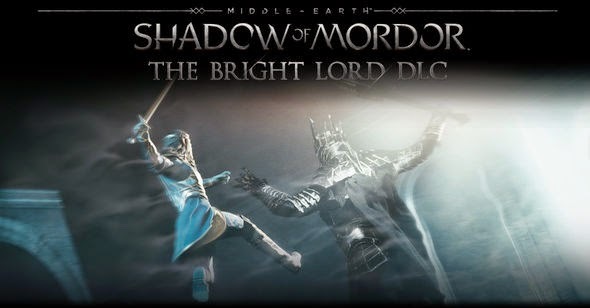 The Bright Lord, a second set of DLC, takes place thousands of years before the main story, and allows the player to play as Celebrimbor. I would highly recommend playing The Bright Lord as we learn more background about Celebrimbor and also helps to explain the ending of the main game. Guardians of the Flaming Eye is an exclusive DLC to Season Pass holders, and allows players to battle Sauron’s defenders before the Black Gate and earn a special rune called the Wolf’s Head. The Trials of War is a challenge map includes several challenge modes: Test of Power, Test of Speed, Test of Wisdom, and Endless Challenge. Playing Shadow of Mordor on the Xbox One, I can say that the visuals are a real treat, Uruk, Graugs, Caragors, and Ghuls all look incredible, with great attention to detail including their armour facial expressions, and animations. For the most part, the game runs very smoothly with the occasional visual oddities. Such rarities include the camera showing the back of a wall that the character was in front of, and a bit of stuttering when there was a lot of action on the screen that had explosions, Morgai Flies, Morgul Bats, and 20 Uruks. As one can expect with such a finally polished piece of work, the sound in Shadow of Mordor is exceptional. Composed by both industry veterans Garry Schymann, who has been nominated and won many awards for his previous soundtrack work in games, and Nathan Grigg, who has been composing music for games since the early 1990’s. I found myself on the edge of my seat, and heart pounding during intense battles due largely to the amazing score. Players can see that attention to detail was of immense importance to the game developers. In game play, while traveling across the land and passing by Uruks, even those you are not interacting with, they carry on conversations amongst themselves that are relevant and if you are lucky sometimes will hear them talking about Warchiefs and their weaknesses. After playing and completing Shadow of Mordor I can genuinely say it is one of the most skillful, and finely polished open world games in recent memory. There is enough content included on disc to keep you busy for hours upon end, and even when you have beaten the game there is still more to experience through the available DLC. A few minor annoyances in the game doesn't keep this one from getting my recommendation. If you haven’t played this yet go do yourself a favour and pickup this game you won’t be able to put it down.